The patron of Boda Boda 2010 Association, Abdallah Kitatta has distanced himself from the disgraced vigilante outfit. Kitatta, who’s also the National Resistance Movement (NRM) party chairperson for Rubaga division, denied ever being a leader or member of Boda Boda 2010. The vigilante outfit has over the years been accused of meting out brutal acts on Ugandans with protection from the Uganda Police Force. Kitatta was appearing before the General Court Martial chaired by Lt Gen Andrew Gutti on Monday to defend himself on charges of illegal possession of firearms and military hardware. 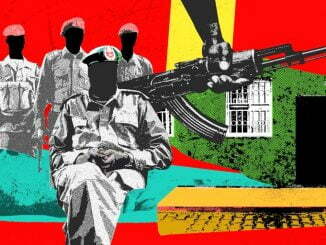 The items including two pistols, SMG rifle, 55 rounds of ammunition, military uniforms and head gears were reportedly recovered from his room at Vine hotel in Wakaliga in 2018. He explained that he is the Rubaga Division NRM party chairperson and the National Union of Drivers and Cyclists and Allied Workers Association (NUDIKAWA). He also denied knowledge of the military items that were recovered from the Boda Boda 2010 offices in Nateete, saying they belonged to the leadership of the association of his co-accused, Joel Kibirige. Kitatta further told court that he has never had or owned any guns – gold-plated or otherwise as has been portrayed by the state. On the the famous golden pistol which was allegedly found in his possession, Kitatta said he only first saw the golden pistol when it was being paraded in court during the testimony of private Richard Kasaija, a state witness. He told court that his police bodyguard, Ngobi Sowali was in better position to explain the SMG rifle that was found in his car. Kitatta’s lawyer, Shaban Sanywa asked his client to explain to court how he acquired the bodyguard. 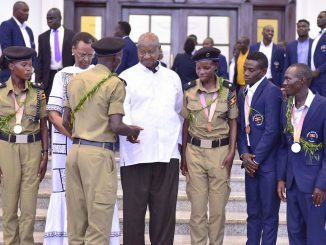 Kitatta explained that during the 2009 violent Buganda riots, he contacted President Yoweri Museveni and asked him for personal security. 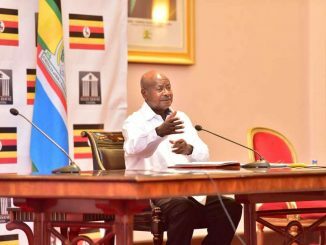 He explained that Museveni directed the then former Inspector General of Police, Gen Kale Kayihura to provide him with a police bodyguard. 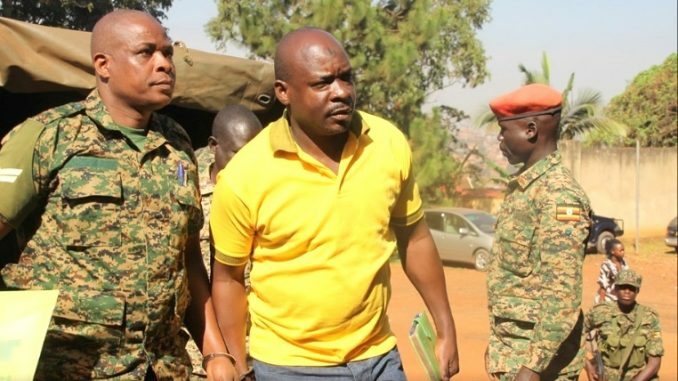 Prior to his testimony, Kitatta told court that he was arrested by detectives from the Chieftaincy of Military Intelligence from the bathroom of Vine hotel where had gone for a meeting as the Rubaga NRM chairperson and that he only had his mobile handsets. He promised to avail his co-accused including Ngobi Sowali and Ibrahim Sekajja as witnesses. Kitatta pleaded with Lt, Gen Gutti to review the video footage from Vine hotel before making his decision. Kitatta is jointly charged with Joel Kibirige, Fred Bwanika, Amon Twinomujuni, John Sebandeke, Hassan Ssebatta, Matia Senfuka and Hussein Mugema. These will be defending themselves on why they were found at Boda Boda 2010 offices in Nateete where military hardware was recovered. The group had previously been charged with three others who were acquitted because they had no case to answer. The accused persons have been remanded until January 21 when they will return to defend themselves.